The humble ute; carrier of dogs, mover of furniture, and often a young man’s (or woman’s) rite of passage into adulthood. 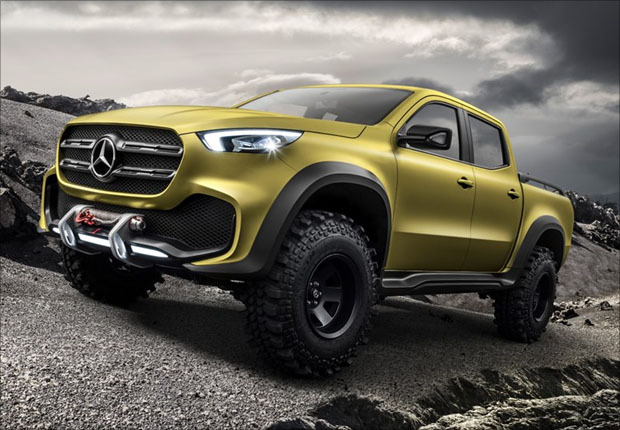 This icon of Australian motoring is about to step into the luxury car bracket with the release of the Mercedes Benz X-Class. And while Mercedes has a long history of producing commercial vehicles, this will be their first foray into the world of the dual-cab ute. Now some of you may be of the opinion that we already have many luxury utes here in Australia, but the truth is that a top-of the-range Nissan or even Australia’s most popular car, the Toyota Hilux just don’t have that magic appeal of a Benz. Interestingly, those that are expecting a solid German piece of engineering when they pop the bonnet on their entry and mid-range models will be surprised to find a Japanese engine. The Pure and Progressive models will have a Nissan 2.3-litre turbo diesel which, while an impressive engine, isn’t a Benz. 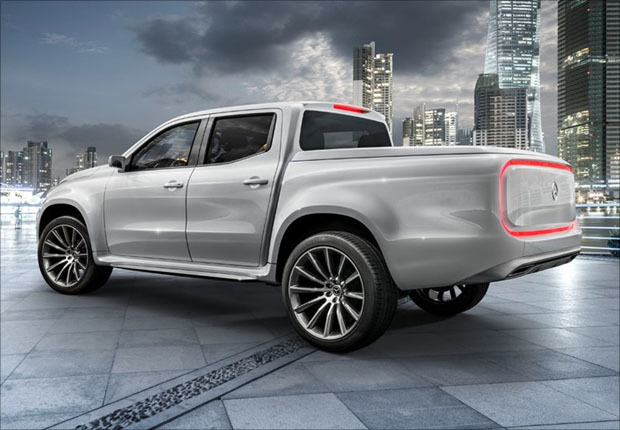 For those that want an entirely German ute, they’ll have to invest in the top-of-the-range Power model which boasts a Mercedes 3.0-litre turbo diesel V6. Both the Pure and Progressive models will be available in rear-wheel-drive or four-wheel-drive while the Power will come in four-wheel-drive only. As for the gearbox, all models come with either six-speed manual or seven-speed automatic. Mercedes have something of a reputation to uphold when it comes to luxury so while they have no qualms about putting Nissan engines and gearboxes in their utes, the interior is a different story. Although the Pure is the entry level model that most Tradies would opt for, there are still enough elements from the brand’s passenger range to give it that better-than-your-average-ute feel. But it’s in the Progressive models where you’ll really start to get the sense that you’re in a luxury car as opposed to a workhorse. Faux leather seats and plenty of silver trimmings make this a ute that you could pick up a date in. But as with the engine, if you want that pure Benz experience then the Power model offers a full leather interior, wood grain or aluminum style dash inserts, and plenty of padded and stitched trims. The most notable interior feature though is the iPad-like central screen which will be available in every model. Aside from being the best-looking ute ever, the X-Class can fairly handle itself. It has a larger cargo bed than the Nissan Navara and a coil spring rear end that will carry a payload of up to 1100kg with ease. It’s also no slouch when it comes to towing with every model reportedly able to pull up to 3500kg. If it can deliver on its promises, then this ute is no show pony. But isn’t it just a glorified Nissan Navara? The new X-Class ute is based on the Nissan Navara, so it’s easy to assume that the two will be pretty much interchangeable, but Mercedes have made enough changes to both the interior and exterior for this to stand as a new vehicle in its own right. They have also added some incredible driving technology that will make this the most hi-tech ute on the market anywhere in the world. This will be the first ute in Australia to have automatic emergency braking and will also feature forward collision warning and lane assist. They are even putting in a 360-degree camera and Sat Nav in the Power model while the lower models in the range will get a reversing camera as standard. The first X-Class utes will go on sale here in Australia in early 2018, so there are no firm prices as of yet for each model. However, it’s expected that prices will start at $40,000 and work their way up to $70,000. This will make it the most expensive ute on the market but, in fairness, did we expect anything less? Despite its high price tag, the indications are that this vehicle will be worth the investment. With Mercedes reputation for reliability coupled with their luxurious brand image, we imagine that not only will these utes last a lifetime (relatively speaking of course), but they will also hold their value quite well. If you’re tired of your HiLux or simply can’t pass up the opportunity to drive a Benz to your job site, perhaps the X-Class is the ute for you. And don’t be too quick to think that you can’t afford a Mercedes. Get in touch with one of our car finance consultants who will be only too happy to talk to you about sourcing other finance options besides your local dealership’s in-house finance package. Who knows, this time next year you could be picking up your workmates in a brand new X-Class.